A few days ago I came across a tabletop role-playing game called Troika!, by Daniel Sell and Jeremy Duncan. A surreal fantasy adventure game with an elegant set of easy-to-use rules just under sixty pages in length. I write about it here because of the Wolfe inspired gems I found within its character creation pages. A few familiar sounding vocations are available as options (which are randomly rolled) for the player characters, such as Cacogen, Zoanthrop, and Journeyman of the Guild of Sharp Corners. Obviously, these options aren’t exact duplicates of what you’d find in The Book of the New Sun, but they certainly pay a bit of homage to the Urth Cycle versions in their descriptions. It’s good to see because, in my opinion, Wolfe’s work isn’t referenced as much as one would expect in the RPG industry. 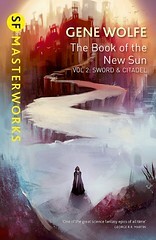 Monte Cook mentions TBotNS as one of his influences for Numenera, but I’ve seen no other mention of Gene Wolfe or his books since the publishing of GURPS New Sun by Steve Jackson Games back in 1999. What I would genuinely love to see is a Burning Wheel resource for TBotNS. Burning Wheel’s sophisticated game mechanics would fit together nicely with the setting and characters of Urth, but a project like that would definitely be an immense undertaking.